Around this time last week we were preparing for our first Life Night of the year. 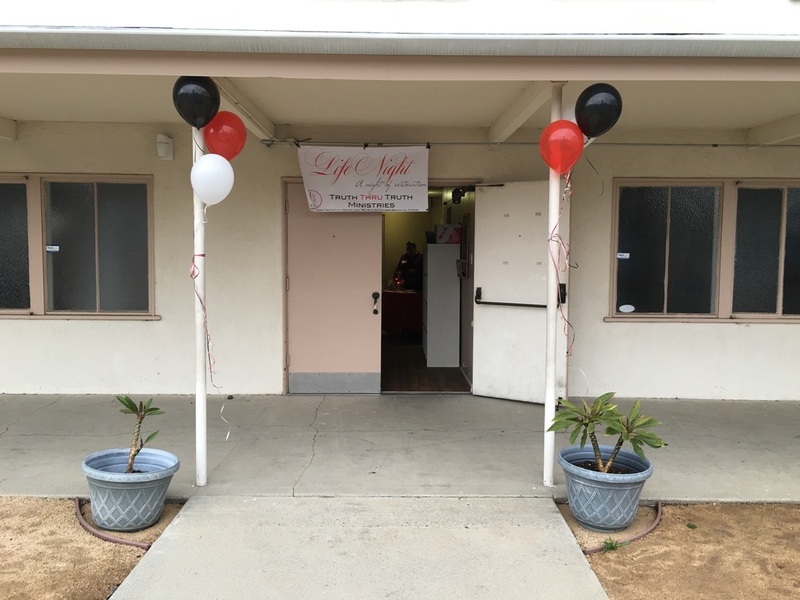 Life Night is an event where women who are having any difficulty with their abortion decision(s) come together in a safe and confidential space to share. In this small and intimate setting there's a lot of sharing, a lot of listening, and a lot of talk about God's grace. Last Friday was no different! It is a blessing to be able to walk with these women through the beginning of their healing process. One thing that is constant is that the things that come up are always bigger than the choice to have an abortion. It brings up issues with mates, relatives, and the circumstances surrounding the pregnancy and its termination. All the stuff many people do not feel they are allowed to talk about or have a space to talk about we give space for at Life Night! I'm so grateful that these women were courageous enough to take that journey of reflection! The women present were open and honest and because of that they were blessed. They are able to recognize areas that are in need and areas where they have overcome! We believe it was an amazing and impactful night! If you or anyone you know may be in need of assistance through your healing process we are here and will be starting a Bible study soon! Please make contact by clicking here if you have any questions, comments, or concerns. If you want to host a Life Night for your church, women's group, social club, book club or whatever else, please make contact here. Our first Life Night…Was perfect!!! On December 16, 2014 Truth Thru Truth Ministries hosted an intimate evening of food and fellowship that gave life, spoke life, and honored the life of the unborn through simple recognition. God orchestrated a perfect night, hand picking the women present, changing up the workshop material last minute, and providing space for laughter in what could be a very heavy and draining topic for most! Together we discussed God’s grace, the enemy’s attempts to keep us silent, and the importance of our testimony! Most importantly everyone in attendance was able to share their experience in an atmosphere of love and compassion. · Meant to take the shame of our abortion decision(s) and exchange it for God’s love. · Designed to take the questions about the unborn child(ren) and address them. · Created for the one who is tired of being quiet and recognizes that they need a place to let it out. We hope to see you at our next Life Night! Want to host a Life Night at your church or women’s group? Click here. While I have spoken with some of you all through email, it has been a little over a month and a half since I blogged or posted anything on Truth Thru Truth’s behalf. 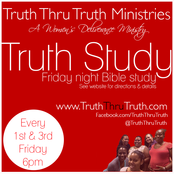 This ministry was birthed out of a blog I called, “My Truth Thru the Truth…God’s Word”. 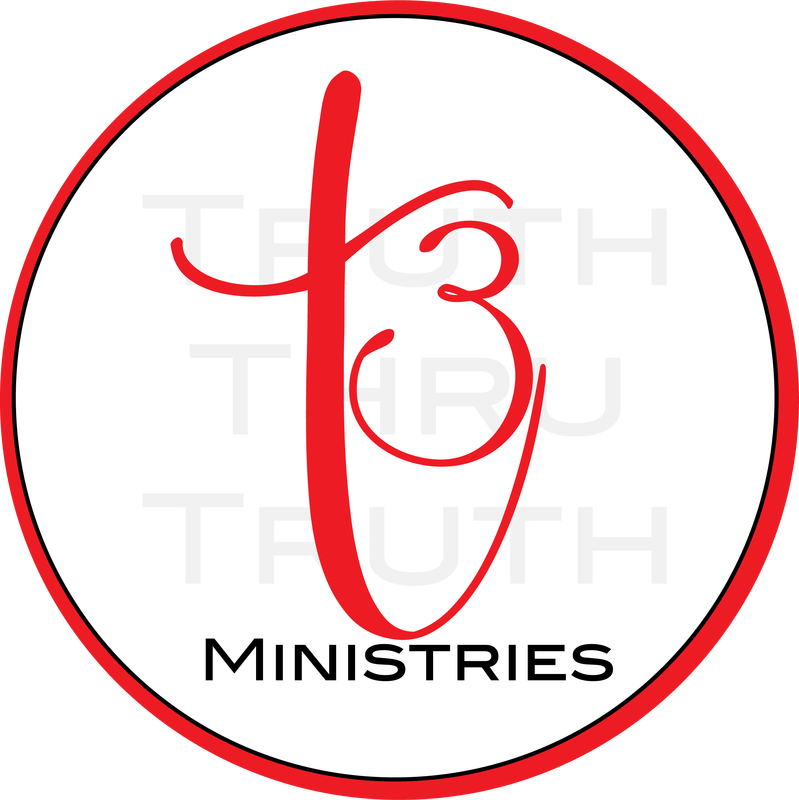 In January of 2014 it transitioned into an actual ministry with blogging and Truth Studies being the prime method of outreach. In recent months I became increasingly aware that the vision God gave for this ministry was often stated but not being followed. This is the reason for the most recent hiatus. It gave time for us to regain footing so that God’s will for this ministry is fully carried out. 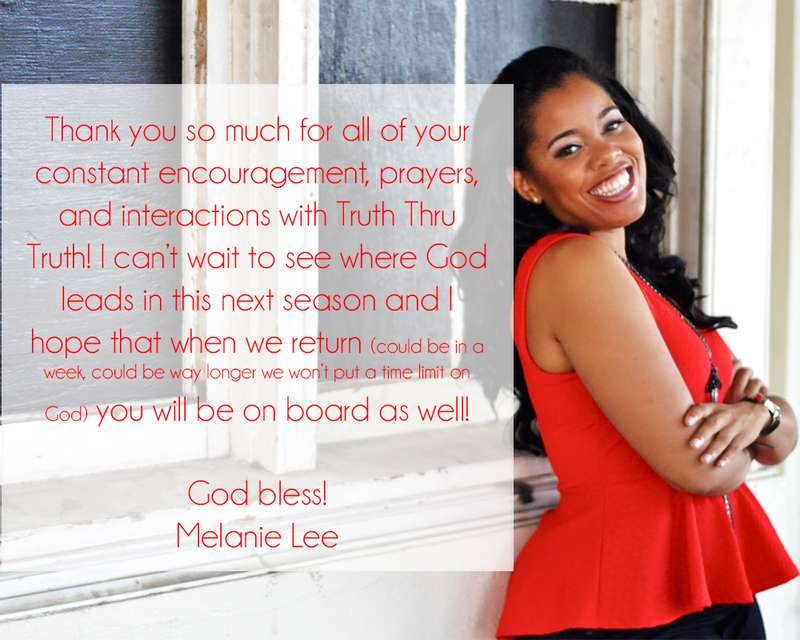 I’m grateful to return with renewed focus, restored vision, and a revived spirit. Blog posts will come as inspired but will not be guaranteed weekly as they have been in the past. I hope that you will continue to be apart of these endeavors as they are introduced. Our first event, “Life Night”, will be held Tuesday December 16, 2014 at 7pm. This event is for women who have experienced or participated in an abortion and are having a difficult time finding peace, joy, comfort, and forgiveness in God and self. You may not have experienced an abortion but I’m sure you know someone who has. Pass this information along if you can =) Find out more by clicking here. Worship and praise have literally been saving my life. When I’m intent on being in this place, I’m safe. It’s in pure worship that I can hide in the arms of El Shaddai! The Lord Almighty! Whether it’s a loud shout, quiet phrases expressing my gratitude, reading for understanding in his word, or simply walking obediently in his will, entering into his presence has been the safest place to be. No matter where I am, what time it is, or what I’ve done, with a repentant heart, he receives me, restores me, and redirects me. Even if it has to happen 5 million times in one day. God doesn’t want us lost, hurt, feeling abandoned, and disconnected from him. He wants us aware that he is a very present help in the time of trouble (Psalm 46:1). He wants us aware there is peace in him. He wants us aware that although we may continue to walk away from him, he will never leave or forsake (abandon) us (Deut 31:6). When we worship and praise we begin to magnify how good he is and all the good that’s happening in our lives. We recognize his love for us and if we are willing to receive him, we have the opportunity to feel his Spirit intertwine with ours for an inner renewal that cannot be explained. It’s these precious moments with God (alone in your bathroom or in corporate worship) that solidify his existence, give you what you need to take an extra step, and fill you with peace, joy, and contentment! Worship is not something that just happens on Sunday’s, during midweek service, or early in the morning. It is something that can occur with every thought, every step, in every moment. Worship is a weapon that you don’t have to use sparingly! Be excessive with it!!! When you need him call him but you have to be in right position to receive. For months I’ve been praying and crying out for a lasting restoration of joy, peace, and contentment but I wasn’t in proper position to receive it. I unknowingly had both hands up blocking what God had repeatedly sent me. I was in the business of asking God for help and then taking over his job. I worked hard to fill every void, and as people (my fillers) acted up or disappeared the voids became wider. As those things (more fillers) that once momentarily quenched a deserted part of my soul were no longer available to me, I became all the more lost and broken. I gasped for any and everything to give me life including Jesus but as soon as I grabbed hold I let go for what was directly in front of me. Grabbing onto temporary people and things makes it difficult to see what God is really trying to do in our lives. We have to leave ourselves open so God can give. We have to be in a position where we are open to receive the blessings he pours out. And we have to believe that we are worthy to receive those blessings. Last week as I sat in a meeting at church I was overcome with just about every negative emotion I have felt in the last 9 months. All I knew to do was go to the altar. I made my concerns known to God for the millionth time but this time I opened my heart to receive only him regardless of how undeserving I felt of his love. From that moment on, his overwhelming presence has met me wherever I go and done some major restoring. One thing I learned over the last few weeks is that condemnation will lead us to reject a gracious and merciful God. When you don’t feel deserving of his love, you won’t receive it. Therefore you won’t receive the liberty, peace, joy, or cleansing that he imparts. This leaves us to seek these gifts out in temporary people, places, and things that can kick start a cycle of greater condemnation –> further rejection of the God you’re praying to— > deeper into the sins which tear us away from him. Breaking the cycle involves knowing that you are not condemned but redeemed. You’re forgiven! Receive him. If you’re in need of him call him but you have to be in right position to receive from him. Let go of the guilt of yesterday and of the temporary fillers and reach for the everlasting Father. I guarantee you he will pull you up and out. It's the fourth time my phone has dropped this call. What’s up with the connection, I have all my bars! But do they? This isn’t normally a dead zone! Are they in one? My battery is charged but is theirs? I believe God is looking down at us sometimes with the same thought. He is speaking and we mute or put him on hold because we are too busy talking to someone else. Purely distracted. We are constantly walking into dead zones (moving too quickly, going places we shouldn’t be or entangled somewhere in our past) causing our lines of communication to drop him altogether. Our line of communication with God is open at all times, we can go to him day or night, it doesn’t matter. But it is us who drops the calls by hooking up with whack carriers we put our faith in instead of him. Today I ask you to not walk into dead zones, press hold, or mute God. Leave the line of communication open so you are prepared for what you will face in the next moment. How many times have you clicked over to another caller and left him on hold for hours, days, weeks, must I say years? These callers (people, places, or things) that have caused you to ignore God have taken a seat in your life that used to, and should always belong to God. This substitution can be referred to as idolatry. What a dangerous place to put them in, what a dangerous place for you. It’s time to click back over. No dropped calls, no surprises! Several people I’ve spoken to over the last month are all chasing after the same thing…Peace! The bible does tell us to seek peace and pursue it (Psalm 34:14) BUT the problem is we are seeking it in all the wrong places. In him, her, that drink, those cigarettes, those drugs or pills, that group of people, that club, food…the list goes on. We will only find pseudo-peace there beautiful people! Pseudo meaning, false peace. That means when it fades, we are back to square one. We need to seek peace by seeking God. Although at times it is far easier said than done, it’s not impossible if we focus our eyes on the God who promises to give us surpassing peace. Matter of fact the bible says if we come to him he will give us a peace that surpasses all understanding, meaning this peace will excel above and beyond what we can even imagine, comprehend, or explain. This struggle for peace is never ending for me as well! A couple of weeks ago I thought I was about to lose my mind! I prayed before I walked into a certain location asking God to help me to just feel better. I knew I needed him but wasn’t really able to pinpoint what it was. My request was just for him to “make it better”. I was anxious, feeling convicted, I was sad, and angry all at once and the poor person that was in my presence was about to catch all of it. All of a sudden this inexplicable calm came over me. I guess I can explain it as an empty feeling. Like all the things that were going on with me just disappeared. In this moment the second portion of Phil 4:7 began to make sense to me. It says this peace will guard your hearts and minds in Christ. When I wanted to recall what had upset me, what was causing me to be anxious, what was making me sad and convicted, I couldn’t. The thoughts wouldn’t come. And for some reason I was trying to force them back as if I wanted to feel those ways. The pain that my heart was feeling was eradicated. Even when I tried to pull the thoughts back God blocked it. Not only did he take away all the yuck I was feeling but he guarded me from going back to what was causing me to feel that way. When I got in my car I just said, “thanks God, thanks for freeing me from myself”. God has asked us not to worry about anything and earnestly make our requests known to him (v6). We might not immediately feel the total relief of the prayer but believe that once you hand it over he is already working. Then it’s time to do your part. Are you going to invite the thoughts and people that are causing you to lose your peace back in? Are you going to basically fight God so that they remain? Don’t allow chaos to be your equilibrium! Go to God for a total peace that is “of” him and will exceed anything you can understand or explain. And let him guard your heart and mind! You can have peace! Receive it and keep it! Resist the devil and he will flee. Right? "I'm tired of the repetition, I resist he walks to the corner taunting me then comes right back"
Last week I had a few things bombarding my mind causing stress to the highest power. It felt horrible so I knew I had to deal with the negative thoughts the enemy had planted...so I used the only word I could think of to help me at the time..."Jesus"! Do you know I probably said Jesus 1,000,000 times that night before my mind was at ease and I was able to fall asleep? One who doubts might say, "Where was your God? A million times? Does it take all that?" And I'd say, "Yes sometimes it does but he was right there with me telling me don't give up." You see normally I would have let those thoughts kick into overdrive and next thing you know I'd be crying myself to sleep only to wake up with a headache and then cry my morning away. Jesus re-taught me something that day…resisting the devil (even with something like a thought pattern) will often consist of a serious PRESS. The devil is not a punk and we can't be either! Through the press we gain endurance, an increased hope in what God can do, victory, and validation that you must be pretty awesome for the enemy to come after you the way that he does. The point, yea it gets rough but that's no excuse to give in! Press and resist that fool! You have work to do!!! Over the last few weeks I have been thinking more about depression and how my private practice can address the matter in a more effective way. With attention drawn to suicide and depression because of the recent passing of Robin Williams I thought it would be wise to address a few things you can do to restore or keep joy if you feel yourself sliding into a bout of depression. Let someone know how you’re feeling. (Don’t know who to talk to, pray for God to bring someone in your path who can help you…he will) If you don’t know the cause that’s ok! If you don’t know how to fix it that’s okay too! Just talk about what you’re feeling and see if you can brainstorm practical ways to get back to an equilibrium! Whatever you do…don’t remain silent! 3. Don’t be afraid of therapy! Even as a licensed therapist I have a therapist and it’s one of the best gifts I could ever give myself. Everyone needs a place they can release the tensions of everyday life especially when it gets overwhelming. Sometimes you just need that space with someone who desires to see you better without judgment or bias.